Luis Suarez and Lionel Messi scored as leaders Barcelona regained their five-point lead at the top of La Liga by beating 10-man Villarreal. Barca were facing a third successive league game without a win after Suarez and Gerard Pique hit the woodwork. 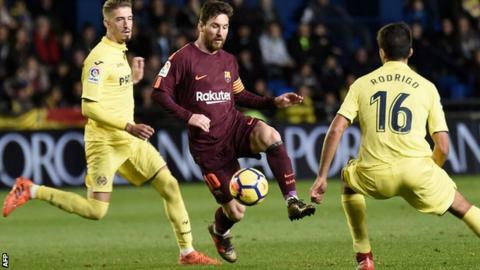 The game was goalless when Villarreal midfielder Daniel Raba was shown a straight red card for an ugly 60th-minute challenge on Sergio Busquets. Suarez rounded the keeper to score 12 minutes later before Messi made it 2-0. Villarreal, who are sixth in the table, made Barca work hard for their 12th league win in 15 matches this season. It required a fine one-handed save by goalkeeper Marc-Andre ter Stegen to keep out Roberto Soriano when the game was goalless. However, Barca made their extra man count with two goals in 11 minutes. Valencia are second in the table, while Atletico Madrid are third, six points behind Barca, after Saul scored their winner in a 1-0 victory at Real Betis earlier on Sunday. Real Madrid, who hammered Sevilla 5-0 on Saturday, are fourth - eight points behind Barca, who they host on the 23 December. Match ends, Villarreal 0, Barcelona 2. Second Half ends, Villarreal 0, Barcelona 2. Offside, Barcelona. Thomas Vermaelen tries a through ball, but Luis Suárez is caught offside. Corner, Barcelona. Conceded by Sergio Asenjo. Attempt saved. Aleix Vidal (Barcelona) right footed shot from the right side of the box is saved in the centre of the goal. Assisted by Lionel Messi. Attempt saved. Luis Suárez (Barcelona) right footed shot from outside the box is saved in the bottom right corner. Aleix Vidal (Barcelona) wins a free kick in the attacking half. Substitution, Barcelona. André Gomes replaces Sergio Busquets. Goal! Villarreal 0, Barcelona 2. Lionel Messi (Barcelona) left footed shot from the centre of the box to the bottom right corner. Assisted by Sergio Busquets. Offside, Barcelona. Sergi Roberto tries a through ball, but Aleix Vidal is caught offside. Attempt missed. Luis Suárez (Barcelona) right footed shot from the centre of the box is close, but misses to the right. Assisted by Lionel Messi. Attempt blocked. Ivan Rakitic (Barcelona) right footed shot from outside the box is blocked. Attempt saved. Rodri (Villarreal) right footed shot from outside the box is saved in the centre of the goal. Assisted by Jaume Costa. Attempt saved. Manu Trigueros (Villarreal) left footed shot from outside the box is saved in the bottom left corner. Assisted by Mario Gaspar. Foul by Samu Castillejo (Villarreal). Corner, Villarreal. Conceded by Sergi Roberto. Goal! Villarreal 0, Barcelona 1. Luis Suárez (Barcelona) right footed shot from the centre of the box to the centre of the goal. Assisted by Paco Alcácer with a through ball. Attempt missed. Lionel Messi (Barcelona) left footed shot from the left side of the box is close, but misses to the left. Assisted by Jordi Alba. Víctor Ruiz (Villarreal) wins a free kick in the defensive half. Substitution, Barcelona. Aleix Vidal replaces Paulinho. Attempt blocked. Ivan Rakitic (Barcelona) right footed shot from outside the box is blocked. Assisted by Lionel Messi. Luis Suárez (Barcelona) hits the right post with a right footed shot from the left side of the six yard box. Assisted by Jordi Alba with a cross. Substitution, Villarreal. Antonio Rukavina replaces Roberto Soriano. Attempt missed. Roberto Soriano (Villarreal) right footed shot from more than 40 yards on the right wing misses to the left. Assisted by Mario Gaspar. Cédric Bakambu (Villarreal) is shown the yellow card. Delay in match Sergio Busquets (Barcelona) because of an injury. Raba (Villarreal) is shown the red card.